Zacc had lived a long and happy life with his owners who had taken very good care of him for 12 years, until one day he escaped and was captured by the Dallas Animal Control. 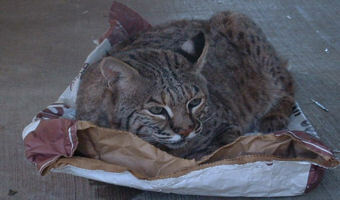 Zacc’s owners were not allowed to keep him in the city of Dallas so were given the option of placing him in a sanctuary or having him euthanized. With the help of the Dallas Animal Control and the Outdoor Learning Center in Plano, Zacc made his way to In-Sync. We were more than happy to give Zacc a place to live for the rest of his life. 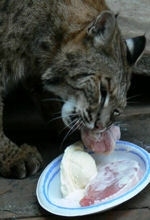 He shared an enclosure with Moses, our very active, wild-born bobcat. At first Zacc found his younger friend a bit too rambunctious at times but grew to love Moses and appreciated his company despite their age difference. Age and arthritis kept Zacc from being overly-active, but he found great pleasure in curling up on his pillow or cuddling with one of his large stuffed animals. When Zacc broke his hind leg our vet told us that recovery would be excruciating for him since he suffered from a degenerative bone disease. So on October 15, 2008, with heavy hearts, we put Zacc to rest.